A decade back I was a confused teenager not sure about the choices I was supposed to make in life and where it would all lead me to. Adding onto it the fact that I was the only black sheep of the family who wanted to go the unconventional way rather than try venturing onto the tried and tested methods. Before you kill me for beating around the bush some background – I belong to a very conservative South Indian family where every second person is either a doctor (Not the medicine wala doctor but a Ph D holder) or an engineer. And here I was a mediocre student who detested the alphabet S purely for it spelt science. They all are either are in government jobs or are professionals having their own practice. So now tell me what kind of advice will they give to a 17 year old who has opted for commerce (while she wanted to do BCA) and is wondering what kind of job to take? Bank jobs, government sector etc were the obvious options that came my way. And all I could do as frown and say BORING! I wanted a job which would make me look forward to it each day and not something that would make feel dreary. I could not picture myself being pushed to work just like I had been to the school all these years. It is there when I realized that only a graduation degree won’t suffice for further growth and my dreams of proving myself to everyone would end up being stifled. That is when distance education came to my rescue. I pursued my masters through distance education from one of the premier institutes and attended evening classes. It not only widened my learning but also helped me meet many like-minded people there helping me evolve more. Today there are more options available and when I look back I feel we had very limited choices to make from. As the options are varied I am spoilt for choices. 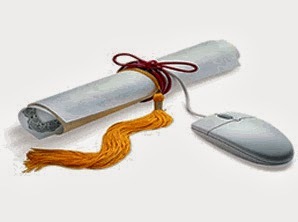 Today we have Edukart, Coursera , Khan Academy , FLIP academy and I am constantly undergoing a course at any one of these for they have such wonderful options available. And I strongly believe learning as a process is constant in life for that helps us keep evolving from time to time and stay abreast about the developments in the world. At the click of a button the whole world with its plethora of opportunities seems to come at my doorstep beckoning me with open arms to come and explore all that it has in store for me. Luckily for me I have finally found a job I am immensely in love with (touchwood!!) and would not trade it for anything. They also encourage learning constantly through various trainings and courses for us. But yes nothing beats the On-the-job learning. I love it so much that a leave is a pain for me!! This is brimming with hope and positive attitude. It is aptly said if you are an actor , the world is your stage.